39271 Angelfish Road, Avon, NC.| MLS# 101176 | Outer Banks Homes For Sale, North Carolina Home Search Including Nags Head, Pirates Cove, Manteo, Kill Devil Hills Kitty Hawk, Southern Shores, Duck, and Corolla North Carolina, Oceanfront and Soundfront properties for sale and long term rentals. 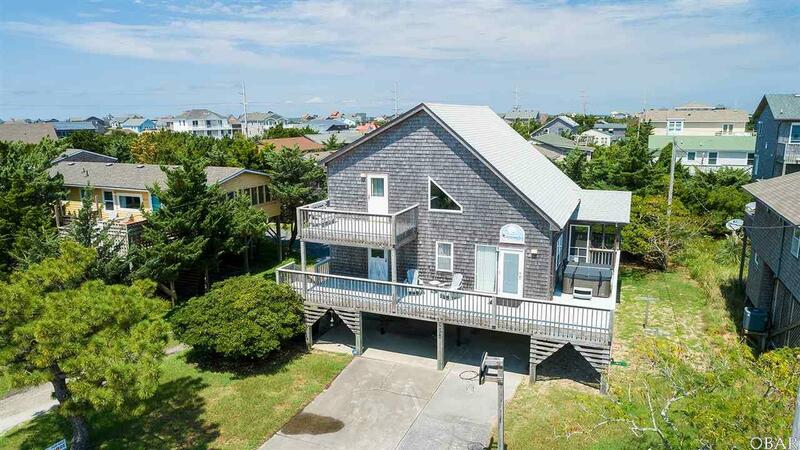 Come see this beautiful OCEANSIDE COTTAGE with a view of the ocean from the top deck. Inside the home, every detail was done with thought and efficiency in mind. The ample closets are very organized and stocked with most every item you need from appliances and cookware. Under the kitchen sink boasts a reverse osmosis water filtration system that's sure to please. Speaking of pleasing, the sound system and TV are surround sound. With VAULTED CEILINGS 20+ feet high, one can imagine the difference. The furniture is NOT A TYPICAL RENTAL HOUSE TYPE, but is furnished with quality you find in a real home. The walls are filled with seascape and beach art, along with curios and keepsakes gathered over the years. In the loft, great place for computer/office with comfy furniture with a wall mount electric fireplace. The bedrooms are appointed with nice furnishings and are carpeted. The great room and kitchen/dining area have Living Flooring PREMIUM VINYL LAMINATE as the floor covering. The roof has architectural shingles that were installed 2013, and the HVAC system was replaced 2015. The SECURITY SYSTEM CONVEYS, all equipment was purchased by the seller, however the buyers will have to contract with the company for the monthly monitoring service. Over 500 square feet of SUN DECKS mostly on the southern exposure allows for sunbathing on those windy northeasters that sometimes blow on the OBX. When the sun goes down, enjoy the 8'X12' SCREENED PORCH eating crabs or taking in the sea breeze. Your pet wasn't forgotten either, as doggie doors are installed to the porch, through the dining area. At the bottom of the steps is an awesome OUTSIDE SHOWER with dressing area. Also, on the ground level are 4 lock up storage areas. At the southeast corner are the laundry room, washer and dryer with room for bikes and beach equipment. Next door to this is the larger storage room with the owners personal items. Nothing conveys in this room save for a mini refrigerator. It measures 16'X11', so a lot of storage here. Next to this room is a 6' X 2.5' locked area, where you can attach your grill to the plumbed propane gas line, connected to the main tank. The northwest corner underneath is called the Tackle Box, but is more like a tackle shop. Rod racks were custom made to fit many rods, drawers in place for terminal gear, and peg board for rigs, lures, etc. that keeps all in good order. All this is waiting for your tackle inventory. All storage areas are well lit and power outlets are well placed should any be wanted for a workshop. The house is wired with a Square D electrical panel. The BEACH ACCESS is 75 yards from the house, leading you straight to the ocean. Many other surprises are waiting for you in this awesome property.